A paradox presents itself frequently at the Calusa Heritage Trail as visitors gripping the newest smart phones express pleasure that pieces of the past are preserved and valued. They ponder shells comprising the bulk of mounds that stood through centuries of human experiences and view illustrated portals to the past created by our signage. At the Trail, they perceive the eternal and perpetual as possible. Now visitors can also visit with living beings that witnessed Calusa children, women, and men years before Europeans first set foot on Florida’s shores. We have determined that saw palmetto plants growing on the Smith Mound parcel are, at a minimum, 500 years old. To establish an age for our palmettos, we used methods developed by Dr. Warren Abrahamson working at Archbold Biological Station on the Lake Wales Ridge near Sebring, Florida. 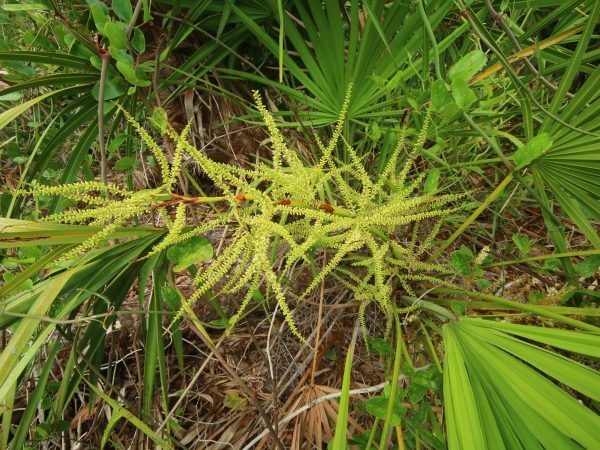 His methods take into account the fact that, like many plants, saw palmettos reproduce in two distinct ways, through seeds and by vegetative sprouting. Seed production begins with flowering in May followed in September to October by oval, yellow-green fruit which turn black when mature. Astonishingly, other scientists at Archbold recorded over 300 “flower visitors” powering up on saw palmetto nectar. Although many of the butterflies, moths, beetles, flies, wasps, and bees are pollinators, there are even more roles these visitors play in Florida’s ecology including serving as decomposers, which recycle biological matter in the environment. Wildlife biologists note that the ripe fruit is eaten by gopher tortoises, wild turkey, white-tailed deer, Florida black bear, and raccoons, and the tangled thickets of trunks are den sites for the Florida panther. Yet, according to Dr. Abrahamson, it may take a palmetto sprout one hundred years to become an adult. Vegetative sprouting is the primary method for saw palmetto propagation. What we see as a long, pithy stem with fan-shaped leaves on one end is known to botanists as a ramet. If the leaves are the head and you follow a ramet toward the tail you often find places of branching. Frequently, the tail becomes disconnected and grows independently. Measuring ramets, Dr. Abrahamson and his team found stunningly slow growth rates of only .6 to 2.2 cm per year (.24 to .86 inches). True to everything about palmettos, ramet longevity is just one part of a much more complex story. Although ramets function as distinct organisms, they are actually part of clonal colonies, called genets, facilitated by branching, breaking, and growing. On a 60 x 60 meter plot (197 x 197 feet), using genetic analysis Dr. Abrahamson and his team found that over 250 saw palmettos were “clone sisters” of only five genets. Knowing that the age of a genet depends on the number of and distances between ramets, they applied modeling and mapping techniques to establish minimum, maximum, and average ages for each of the five clonal colonies (genets). Remarkably, their data revealed estimated ages ranging from 1,227 to 5,215 years, and these estimates are thought to be conservative because there may have been ramets outside their plot not included in the measurements and they assumed an average steady growth rate in their calculations. 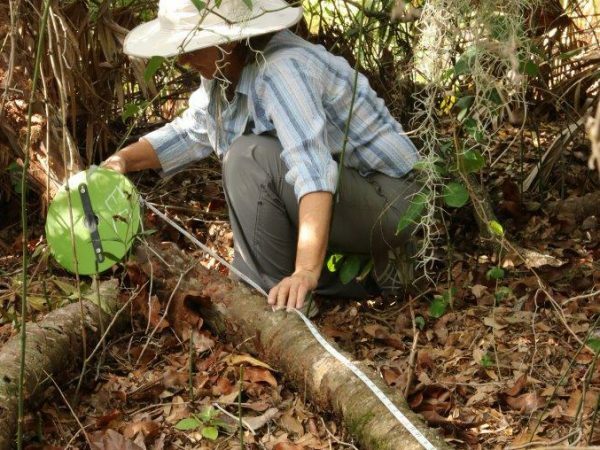 Further, they note that their model did not account for the “conservative estimate” of 100 years for a sprout to become an adult, leaving Dr. Abrahamson to suspect that there are “10,000-year-old saw palmetto clones” in habitats at Archbold Biological Station. Here at Pineland, saw palmettos were not evident on our grounds until we acquired and restored the Smith Mound parcel. Then, as the dense overstory of invasive Java Plum, Ear-leaf Acacia and Brazilian Pepper was removed, many of the native plants responded with bursts of showy flowers and plump fruit, and the palmettos responded with new leaf growth. Many palmettos we freed had grown tall and upright reaching for sun rather than growing horizontally along the ground where not obscured by overgrowth. Now that restoration is well underway, we took time to measure palmetto ramets, finding many over 18 feet long and one beauty that is 20 feet, 10 inches in length. We chose to be conservative and use ½ inch per year of growth to obtain an estimated age of 500 years; however, if we use Abrahamson’s choice of a 4-year average of .88 cm (.346 inch) per year, the age estimate for the Pineland ramet is about 720 years old. In other words, the plant was growing at Pineland about 1300 AD – more than 200 years before the first Europeans arrived in Florida! Without genetic testing, we will not be able to determine the relationships of ramet to ramet, nonetheless it is easy to imagine where one was once part of another as we trace ramet locations on the site and imagine the network created through time. Preserved saw palmetto parts and pieces have been found by archaeologists in excavations representing all time periods of Pineland’s past dating from about 100 AD to the 1600s. They have been used by people in many ways. The Calusa used their tough leaves for fiber and twine and likely knew of their medicinal properties and the nutritious value of the fruits. They range widely across the southeastern United States, overlooked by many and eliminated by others. Yet, they have stood as silent witnesses to centuries of human drama at Pineland. Many thanks to volunteer Laura Coglan for helping to free the palmettos from invasive plants and measuring ramets. 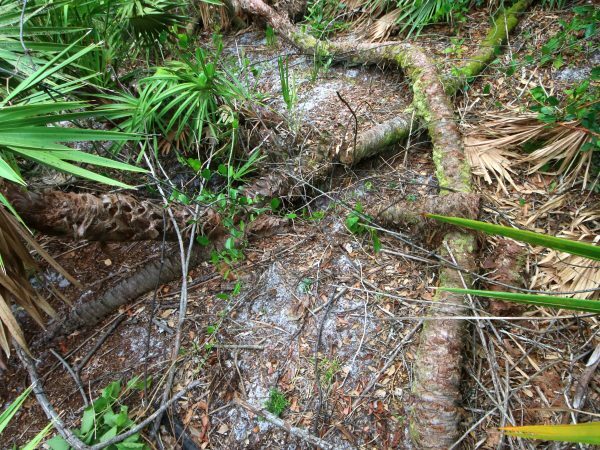 To learn more see: Warren G. Abrahamson (2016) “Age-old Palms on Florida’s Ancient Ridges,” The Palmetto, Vol. 33, No.3, Florida Native Plant Society. 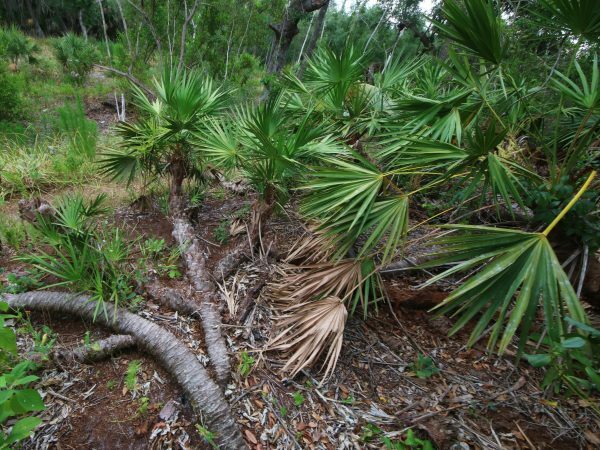 For a summary of historical and medicinal uses for saw palmettos, see page 25 of Martha Kendall’s The Plant World of the Calusa: A View from Pineland, 2015, RRC Popular series no. 1.